Running mate Lyndon B. Johnson Henry Cabot Lodge, Jr.
Presidential election results map. 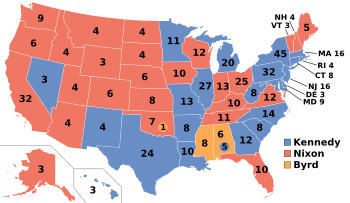 Blue denotes states won by Kennedy/Johnson, Red denotes those won by Nixon/Lodge. Orange denotes the electoral votes for Harry F. Byrd by Alabama and Mississippi unpledged electors, and an Oklahoma "faithless elector". Numbers indicate the number of electoral votes allotted to each state. This election was between Senator John F. Kennedy and Vice President Richard Nixon. Kennedy won the election like many people suspected, but it was a much closer election than most people thought it would be. Incumbent President Dwight D. Eisenhower was not eligible to run again due to serving two terms provided by the amendment. This was the first presidential election in American history in which both candidates debated against each other on television. On television, Kennedy appeared calm while Nixon appeared nervous. More television viewers thought that Kennedy won the debate, while more radio listeners thought that Nixon won the debate. This election was the last to not count District of Columbia as an electoral vote until the 1964 election. Senator John F. Kennedy announced his candidacy for President on January 2, 1960. Vice President Richard Nixon announced his candidacy on January 9, 1960. John F. Kennedy, U.S. senator from Massachusetts. Lyndon B. Johnson, U.S. Senate Majority Leader from Texas. 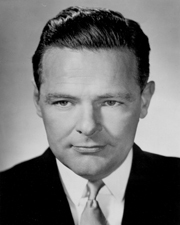 Stuart Symington, U.S. senator from Missouri. Adlai Stevenson, former governor of Illinois. Hubert Humphrey, U.S. senator from Minnesota. Wayne Morse, U.S. senator from Oregon. Pat Brown, Former governor of California. 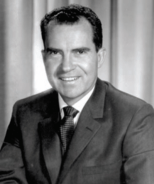 Richard Nixon, U.S. vice president from California. Nelson Rockefeller, governor of New York. Barry Goldwater, U.S. senator from Arizona. United States presidential election, 1960 Facts for Kids. Kiddle Encyclopedia.